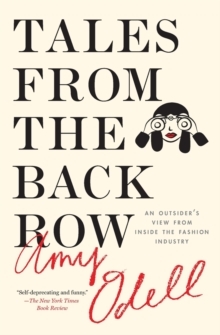 In the "funny, insightful" (Harper's Bazaar) Tales from the Back Row, Cosmopolitan.com editor Amy Odell takes readers behind the stage of New York's hottest fashion shows to meet the world's most influential models, designers, celebrities, editors, and photographers. But first, she has to push her way through the crowds outside and weave her way through the packed venue, from the very back row to the front. And as Amy climbs the ladder she introduces an industry powered by larger-than-life characters: she meets the intimidating Anna Wintour and the surprisingly gracious Rachel Zoe, not to mention the hilarious Chelsea Handler, and more. As she describes the allure of Alexander Wang's ripped tights and Marchesa's Oscar-worthy dresses, Amy layers in something else: how the fashion industry is an exaggerated mirror of human fallibility, reflecting our desperate desire to belong, to make a mark. In her "light-hearted, cocktail-hour confession from someone who is...sober enough to recognize insanity for what it is" (The Washington Post). Welcome to the weird and wonderful world of high fashion: "Whether you're interested in pursuing a career in publishing, public relations, or design, or you're just fascinated with what really goes on behind-the-scenes without the usual sugar coating, we'd say this is required reading" (Fashionista.com).